[Introduction] Splenic artery aneurysm is not common disease, but has a risk of rupture as the other visceral aneurysms. There are some reports to embolize it by interventional approach, however many of the cases resulted in splenic infarction and consequent splenectomy. Open surgical treatment is the current standard for those cases. We report a case of successful laparoscopic surgery for splenic artery aneurysm. [Patient] 59-yaar-old man who has hypertension admitted a hospital complained slight back pain. Multi-slice CT scan and MR-angiography showed winding splenic artery and an aneurysm at the pancreas body. The patient consulted us to operate it by laparoscopic procedure. [Procedures] We set the same settings as our laparoscopic splenectomy. We put one of each 11mm and 12mm trocar and two of 5mm trocars. After the dissection and mobilization of spleen and pancreas body from left side, the splenic artery aneurysm was identified. The splenic arteries were isolated, and then the aneurysm was clipped and resected. Splenectomy was performed after confirmed insufficient blood flow in spite of the other branch of splenic artery. All procedures were performed at a time under laparoscopic. [Results] The operating time was 259 min and the bleeding was 100g. Post operative course was uneventful and the patient was discharged at the five post operative days with minimum wound. 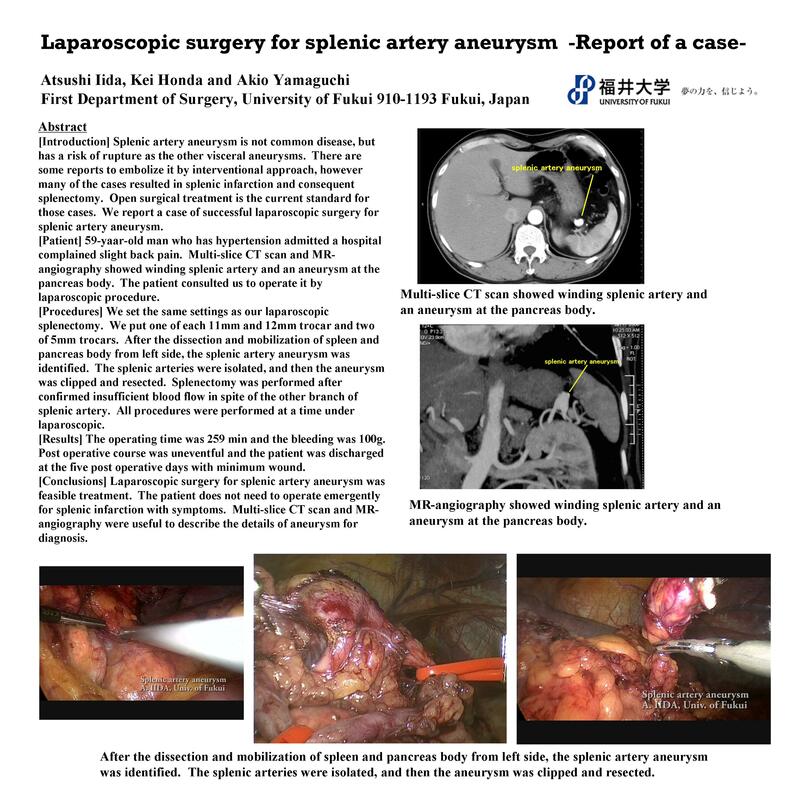 [Conclusions] Laparoscopic surgery for splenic artery aneurysm was feasible treatment. The patient does not need to operate emergently for splenic infarction with symptoms. Multi-slice CT scan and MR-angiography were useful to describe the details of aneurysm for diagnosis.